Regional, subregional and other international organizations play a central role in preventing, managing and resolving conflicts. The United Nations (UN) Department of Political and Peacebuilding Affairs is providing support to those seeking to establish or strengthen their mediation capacities. Several institutional partnerships have been established in preventive diplomacy and mediation, with modalities being tailored to the needs, mandates and requirements of the respective partner organization. Biennial meetings of senior experts from the United Nations, subregional, regional and other international organizations on conflict prevention and mediation have proven a valuable forum for exchanging lessons learned and building cooperation. This initiative was conceived at the 2010 retreat of the Secretary-General with heads of regional organizations. To date, there have been two five meetings at the senior expert level. In 2017, the fifth Biennial Regional Organizations Meeting took place in Djibouti under the auspices of IGAD. Aside from the UN, nine regional organizations were represented at the meeting, including IGAD, AU, EU, SADC, OIC, LAS, EAC, ECCAS and ASEAN represented by the Institute for Peace and Reconciliation (AIPR). Discussions focused on four main themes: local and national mediation; engaging non-state armed groups; mediation of election related violence; and natural resources mediation. In 2014 and 2015, two additional meetings were hosted respectively by the League of Arab States (LAS) in Cairo, and the European Union (EU) in Brussels. Both meetings brought together senior experts from the United Nations, the OSCE, the Organization of Islamic Cooperation (OIC) as well as LAS and the EU, as part of a common effort to strengthen cooperation and knowledge-sharing on peace mediation in accordance with the UN Guidance for Effective Mediation. 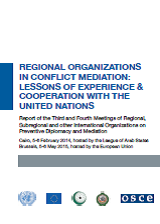 The common thread of discussions focused on a key principle of the UN Guidance: Coherence, Coordination and Complementarity (CCC) in mediation processes, with particular focus on contexts in which one or more regional organizations are involved. Read the report. In 2012, a meeting took place in Jeddah, Saudi Arabia, under the auspices of Organisation of Islamic Cooperation, the OSCE and the United Nations. That meeting focused on getting the perspectives of regional, subregional and other international actors for the development of the United Nations Guidance for Effective Mediation. Read the report. 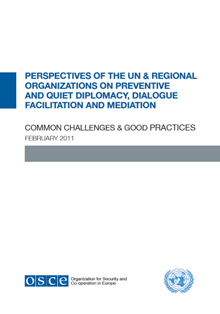 In 2010, the United Nations and the Organization for Security and Co-operation in Europe (OSCE) brought together representatives from the United Nations and key regional organizations in Vienna, Austria, to foster closer cooperation and knowledge-sharing on preventive and quiet diplomacy, dialogue facilitation and mediation. Read the report. 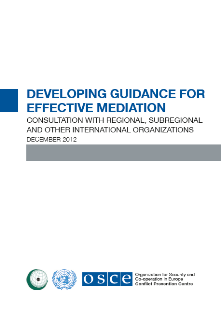 Biennial workshops of existing mediation support entities from the United Nations, subregional, regional and other international organizations were initiated by the United Nations in 2016 to share lessons learned from mediation support as a technical service, with the purpose of making such services more targeted, fit for purpose and effective. The workshops are organized in cooperation with the European External Action Service and bring together intergovernmental organizations with either an existing mediation support office or a commitment to establish such a capacity. In 2018, the United Nations and the European External Action Service (EEAS) brought together mediation support entities from ten intergovernmental organizations. The workshop, organized in Nairobi, focused on exploring mediation support services in the context of changing conflict landscape. Read the summary. In 2016, the workshop, organized in Rome, focused on exploring technical tools and approaches used in delivering mediation support services. Read the summary.